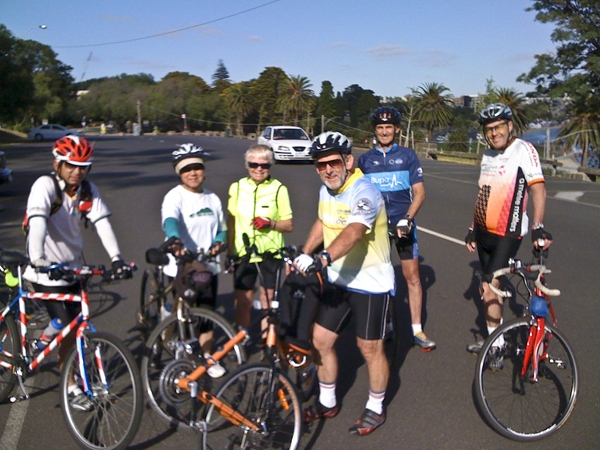 It was a perfect Australia Day morning for John’s short ride to celebrate Australia Day. After a photo opportunity overlooking Eastern Beach, the seven riders (John M (ride leader, Peter and Swee, Helen, Doug, Russell and David F) set off at rather below race speed for two circuits of the Eastern Park criterium circuit that is used for The Bay Classic (and also by Geelong Cycling Club). This was followed by circuits of the park, a visit to look at the lime kilns at Limeburner’s Point, and a saunter to the busy waterfront. Coffee was at The Geelong Boat House – which is a wonderful, relatively new ‘fish and chip ship’ just off the bike path near Cunningham Pier. While the service was a little slow, the coffee was good, and the chips (gluten free!) are great. There is outdoor seating for those buying take-aways, including an upstairs area with good views. There’s also a bistro which serves meals (the fish is suberbly fresh). This has a veranda area right over the water – and more amazing views. This entry was posted in Ride reports and tagged The Geelong Boat House by hlyth2013. Bookmark the permalink.